Not a slasher, but gory as hell. This is a remake of the first film, with better makeup, higher production values, and cool matte paintings. Creepy, odd, quirky, and very entertaining. Bruce Campbell is fun to watch, but he's not the star of the show. Nope, those would be the 'deadites.' 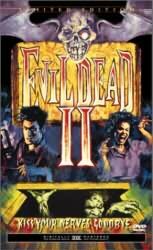 I suppose this would be the middle installment of Sam Raimi's Deadite Trilogy--a fun series for you folks to check out. There are some genuine scares, and oddly enough, some laughs as well. A veritable rainbow of blood colors ooze, squirt, and geyser out of wounds, eye sockets, corpses, and the walls themselves. There's less silliness in this one than in the next episode, Army of Darkness, but for that reason, I like this one more. Remember, the next time your girlfriend/mother-in-law/landlady says, "I'll swallow your soul! ", remember Ash's comeback: "Swallow this." Best Scare: Ooh, the thing in the cellar--that was horrific. And kind of reminded me of a lady I know. I'd Recommend This To: Horror fans all around. Especially gorehounds. 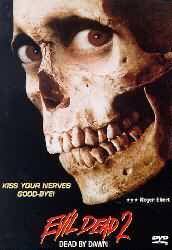 Note: I was lucky enough to see Evil Dead 2 at a revival theater in Los Angeles recently. Only on the big screen with a bunch of cynical-yet-Ash-hungry college students did I recognize the true glory and power of this film. Not a good film, mind you, by any stretch (the acting was laugh-out-loudable, the gore was unbelievably unnecessary, the story sub-idiotic), but a truly enjoyable, crowd-pleasing, stylish, creative, unique, and fun film...a great movie. The low-budget effects were even worse on the big screen, but there, in the dark, howling with grossed-out delight, I was able to buy into it and overlook its many flaws. Walking out of the theater (into an eerily familiar fog), drained from our experience, I understood that this truly was the ultimate experience in grueling terror. New Recommendation: Rent it, buy it, live it. It is really hard not to love the Evil Dead series. The way that Sam Raimi and Bruce Campbell sell horror-comedy is the way it should be done. There are some truly creepy moments and thousands of gallons of blood. But the thing that makes me want to watch this one over and over is Ash. x years ago . . .